The Paschal fast of Holy Week1 is the most ancient part of the Great Fast.2 It is already well attested by the second century, in conjunction with the rites of Christian initiation through baptism. At first spanning one or two days, the fast lengthened to four and then to a full six already by the third century. With the conversion of Constantine, the ensuing flood of people desiring to enter the Faith and imperial interest in holy places, the fourth century witnessed tremendous development in ritual for Holy Week. This evolutionary process continued in the middle ages and shows itself even in our own time. The original emphasis was on baptism for the remission of sins and a filling with the Spirit. The stress soon evolved into baptism as a death and resurrection of the individual, as a personal participation in Christ’s suffering and exaltation.4 As such, Pascha became the normative occasion for baptism. As the numbers of catechumens waned, however, Lent and Holy Week were transformed to a commemoration of past events and to a time of repentance. The attendant rites have, over this course, taken on dramatic elements and a growing sense of sentimentality. By the second century, the very ‘structure’ of initiation in the early Church included instruction in preparation for baptism. The length of this preparation varied and often spanned several years. Then, “As many as are persuaded and believe that these things which we teach are true, and undertake to live accordingly, are taught to pray and ask God, while fasting, for the forgiveness of their sins; and we pray and fast with them”5 for one or two days — Saturday only, or Friday and Saturday — a fast without any food or drink. Dionysius of Alexandria, in writing his Letter to Basiliades around 260, provides us the earliest source for an incipient ritual of Holy Week. Dionysius takes great pains to link each day and hour of Holy Week to events in Christ’s passion, sojourn in the tomb and resurrection. The Syriac Didascalia does the same.8 Hippolytus’ Apostolic Tradition (ca. 215) and Cyprian (d. 258) both link the hours of prayer — for Holy Week and throughout the year — with specific events during Christ’s final week. Cyril of Jerusalem, in the Catechetical Homilies he delivered ca. 350, makes no mention of daily commemorations and ritual. The Cross and the Resurrection, for example, were part of a single, united celebration on Saturday night, for which the six days of fasting were simply preparation. Friday did not yet specifically commemorate the crucifixion.9 But the “current of the times”10 in the fourth century was a historicizing one: eschatological notions were giving way to historical commemoration. Visitors like Egeria carried back to their native lands the memory of what they had experienced in Jerusalem and tried to emulate it in their own liturgical practices. Thus historical commemorations and stational liturgies spread quickly throughout the Christian world, for both Holy Week and the rest of the year. For example, because of the unique situation in Jerusalem, where multitudes of pilgrims descended, they would occupy the church all night in order to have a place for matins, and similarly for the other hours of prayer. Thus, in order to keep the people occupied, services and hymns were celebrated continuously. Clearly it was impossible for the bishop to preside around the clock, so services would begin without the bishop, who would then make an entrance some time later. This practice was imitated in many places, such that ever since the latter part of the fourth century the entrance of the bishop/clergy for vespers, Liturgy, etc., has moved from the opening of the service to some point later, for Holy Week and throughout the year! Also noteworthy is that in the fourth century there developed a consensus that the full celebration of the Eucharist, always a joyful event, was inconsistent with the austerity of the fast. Instead, vespers with Communion was instituted on Wednesdays, Fridays and saints’ days,12 though Egeria declines to attest to the practice of presanctified Communion during Holy Week during the time of her visit. In the ninth century, two learned brothers at the Monastery of Studios in Constantinople — Theodore the Studite and Joseph the Studite, Archbishop of Thessalonica — created a work called the Triodion.13 Covering the period from three Sundays before the start of Lent through Pentecost, including, of course Holy Week, they compiled and composed original hymnography, seeking to bring a return to biblical roots, particularly the Psalms and the Old Testament.14 In doing so, the Studites furthered the earlier historicizing trends and nearly obliterated baptismal themes from Lent and Holy Week texts. Their emphasis was on commemorating salvation history and drawing out ethical and ascetical teachings. Egeria testified to historicizing and emotional tendencies beginning in the fourth century. Not only has this trend continued within the Church from then up to the present, the Orthodox Church has also been influenced by humanistic movements in the Protestant and Roman Catholic Churches, particularly leanings toward the dramatic, intended to elicit sentimental responses of “feeling” in the faithful. On the first three days of Holy Week, the full cycle of offices is prescribed, with distribution of Presanctified Gifts after vespers. One indication of the ancient order of these services is the instruction to offer incense with a katzion, a hand censer, instead of the modern censers on chains. After his entry into Jerusalem, Christ spoke to the disciples about signs that would precede the Last Day (Mt. 24-25). Eschatological themes show up in the troparion of the Bridegroom and the exaposteilarion “I see thy bridal chamber…” at matins. The parables of the Ten Virgins and of the Talents pervade these three days.20 On Monday we also remember the innocent suffering of the Patriarch Joseph as a type of Christ’s. The barren fig tree which Jesus cursed serves as a reminder of coming judgment. Wednesday contrasts the agreement made by Judas with the Jewish authorities to repentance with tears of the sinful woman. The Triodion texts making it clear that Judas’ fall was not so much because of his betrayal as his despair of forgiveness. Since we understand healing and forgiveness in a holistic manner, without a soul versus body dualism, the sacrament of Holy Unction is served in many parishes on Holy Wednesday evening. This practice provides an example of a continuing evolution, a practice which is not prescribed in the Triodion or typicon. In many parishes, this sacrament replaces celebration of Holy Thursday matins. In parish churches today, in order to schedule the services to be more accessible to attendance by the faithful, they are often served “by anticipation.” For example, the typicon prescribes matins to be served at 1 a.m. This is, therefore, anticipated and the service started the evening before. This then pushes the other hours forward, such that vespers and the Presanctified Liturgy are served in the morning. A full eucharistic Liturgy of St. Basil the Great is served in combination with vespers. Repeated use of the hymn “Of thy mystical supper…” combines the themes of Holy Communion and Judas’ treachery. It is used even as the cheroubikon, the hymn that accompanies the transfer of the gifts.21 At this Liturgy the Holy Chrism is also consecrated in patriarchal cathedrals or their equivalents. A foot-washing rite often follows the Divine Liturgy. Here the bishop or other proestamenos renders a dramatic re-enactment of Christ’s washing the feet of his disciples, usually twelve presbyters or deacons. This matins is a solemn service, with many extra hymns, in a variety of tones and twelve Gospel lessons, with lighted candles held by the faithful; yet it is interesting that the Great doxology is to be read rather than sung.23 The matins of Holy Friday clearly harks back to the Jerusalem practice of passion services celebrated at the locations where the events took place, as described in the twelve Gospel lessons which we read at this service. After the fifth Gospel lesson and during the last of the fifteen antiphons of the service, we find a recent development in the rite: a procession with the Cross is made in Greek/Mediterranean churches. Having originated in Antioch, it was adopted in Constantinople in 1824. After the Cross is placed in the middle of the church, a figure of Christ is transfixed thereto with nails, then all venerate it. The Hours take on a special, fuller form on this day, called Royal Hours. First, Third, Sixth and Ninth hours of prayer each include a Prophecy, an Epistle and a Gospel Lesson. Another, slightly older—yet still recent—development of the fifteenth or sixteenth century25 is a procession with the epitaphios26 during the aposticha, where it is carried around the church and deposited on a decorated bier in the center of the church. The vespers on this day may be combined with the Divine Liturgy if the Feast of the Annunciation falls on this day.27 A Presanctified Liturgy was celebrated on Holy Friday up until at least the middle of the eleventh century. By 1200, however, it disappeared abruptly.28 It is interesting to note that while in the Byzantine practice the Presanctified on Holy Friday has dropped out, this is the only day of the year in which the Latin rite has retained the Presanctified Liturgy. It is on the Sabbath, the “Day of Rest,” that truly no Liturgy is properly prescribed (the vesperal Liturgy now commonly celebrated on Saturday morning or afternoon being the original vigil and Liturgy of the Feast). This is the one Saturday of the year where the Eastern Church prescribes and permits fasting. Historicizing and dramatic elements have shaped our Holy Week observance into the majestic Byzantine rites which we know today. The process began in the first century and continues down to our own age. Regretfully, however, many of our people turn out for these beautiful services and are not seen the rest of the year. The services have become such that people want to observe them as they would a beautiful opera, in small doses, but they fail to connect the paschal events with their own lives. The celebration has become so much a commemoration of something so long ago, that it is time we begin sending the pendulum back on this trend and find ways to recover the eschatological dimensions of Pascha. People need to recover the sense of something happening to them, for which they need to prepare, something that sets them apart from the rest of mankind, something that affects the way they live and relate to one another. Theodore and the Studites devised the Triodion precisely because the form of the celebration at the time, with its emphasis on baptism, failed to connect to a society where there were no adult catechumens. They, therefore, transformed Lent and Holy Week to a time of repentance and renewal of one’s baptismal commitment. Now, however, people are ignorant of the Triodion, and the fast is viewed as no more than a set of external dietary rules. Following the example of these ninth century saints, we, in our own time must strive to find ways to bring back a personal connection to the historical events. Deiss, Lucien. Springtime of the Liturgy: Liturgical Texts of the First Four Centuries. Tr. Matthew J. O’Connell. Collegeville, Minnesota: The Liturgical Press, 1979. The Didache. Tr. and annotated by James A. Kleist. In Vol. 6 of Ancient Christian Writers. Johannes Quasten and Joseph C. Plumpe, eds. New York: Newman Press, 1948. Dix, Dom Gregory. The Shape of the Liturgy. 2nd ed. London: Adam and Charles Black, 1945. Egeria. Diary of a Pilgrimage. Tr. and annotated by George E. Gingras. Vol. 38 of Ancient Christian Writers. Johannes Quasten, Walter J. Burghardt and Thomas Comerford Lawler, eds. New York: Newman Press, 1970. Kavanagh, Aidan. The Shape of Baptism: The Rite of Christian Initiation. New York: Pueblo Publishing Company, 1978. Mary, Mother and Kallistos Ware, trs. The Lenten Triodion. London: Faber and Faber, 1984. Nassar, Seraphim. Divine Prayers and Services of the Catholic Orthodox Church of Christ. 3rd ed. Englewood, New Jersey: Antiochian Orthodox Christian Archdiocese of North America, 1979. 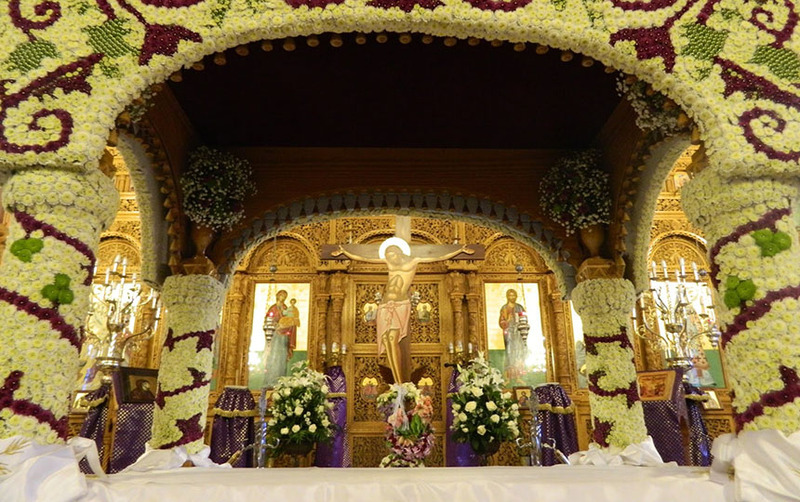 Papadeas, George L. Greek Orthodox Holy Week and Easter Services. Greek and English. Published by the author, 1977 ed. Schmemann, Alexander. Great Lent. Revised ed. Crestwood, New York: St. Vladimir’s Seminary Press, 1974. ________. Of Water and the Spirit: A Liturgical Study of Baptism. Crestwood, New York: St. Vladimir’s Seminary Press, 1974. Schulz, Hans-Joachim. The Byzantine Liturgy. Tr. Matthew J. O’Connell. New York: Pueblo Publishing Company, 1986. Taft, Robert. Beyond East and West: Problems in Liturgical Understanding. Washington D.C.: The Pastoral Press, 1984. Triodion. Greek. New, expanded ed. Athens: Phos (no date). Vaporis, Nomikos Michael. The Services for Holy Week and Easter. Brookline, Massachusetts: Holy Cross Orthodox Press, 1993. Uspensky, Nicholas. Evening Worship in the Orthodox Church. Tr. and ed. Paul Lazor. Crestwood, New York: St. Vladimir’s Seminary Press, 1985.
von Gardner, Johann. Orthodox Worship and Hymnography. Vol. 1 of Russian Church Singing. Tr. Vladimir Morosan. Crestwood, New York: St. Vladimir’s Seminary Press, 1980. 1 The term “Holy Week,” attested in Rome and the West by the fourth century, is equivalent to the “Great Week” used in the East from the same time. Egeria makes note of the difference in terms, Diary of a Pilgrimage, 30. 2 Known as “Lent” in the English-speaking world, from the Old English lencten, meaning spring. 3 Aidan Kavanagh, The Shape of Baptism: The Rite of Christian Initiation (New York: Pueblo Publishing Company, 1978), pp. 23ff. 4 Cf. Rom. 6.1-14, where St. Paul interweaves both of these dimensions. 5 Justin, Apology, quoted in Kavanagh, p. 43. See also: Eusebius, Ecclesiastical History, who cites Irenaeus; Tertullian, On the Fasts; Hippolytus, Apostolic Tradition. 6 Kallistos Ware, “The Meaning of the Great Fast,” The Lenten Triodion, tr. Mother Mary and Kallistos Ware (London: Faber and Faber, 1984), p. 29. 7 Kavanagh, p. 61, quoting from the Gelasian Sacramentary. 8 Robert Taft, Beyond East and West: Problems in Liturgical Understanding (Washington, D.C.: The Pastoral Press, 1984), pp. 23-24. 10 Dom Gregory Dix, The Shape of the Liturgy, 2nd ed. (London: Adam and Charles Black, 1945), p. 348. 12 Council of Laodicea, canon 49. Trullo, canon 52, made an exception for the Annunciation, however, when it came to be celebrated on March 25. Ware, p. 49, n. 58. 13 So called because they reduced the number of biblical odes used in canons for weekday matins to just three from the usual nine. Later manuscript copies and printed editions of the Triodion split the work into two volumes: the Lenten Triodion and the Pentecost Triodion, or even simply Triodion and Pentecostarion. 14 Ware, pp. 40f. In practice, though the new hymnography was scripturally based, it superseded and displaced actual scriptural texts from the services. 16 What are sometimes called “Lamentations” in English, in a flagrant mistranslation. 18 Ware, pp. 42f. Note further that the English edition of the Triodion published by Faber and Faber does not include any of the Pentecost volume. It gives full texts only for the first week of Lent and for Lazarus Saturday through Holy Week. Otherwise it gives little more than Sunday texts, and even there it includes neither the syanaxaria for the Sundays and for Holy Week nor the synodikon for the Sunday of Orthodoxy. Some of these additional texts are available in mimeograph form and paper bound from the Monastery of the Veil of the Mother of God, Bussy-en-Othe, France. 19 As we discuss the services for the six days of Holy Week, we face the question, “To which day does vespers belong? Given that the day begins at sunset, does the service which bridges two days belong to the day that is closing or to the one that is beginning?” Orthodox service books have not always been very consistent here. We will include vespers with the old day, to avoid difficulty with Divine Liturgies, which may be delayed and combined with vespers on fast days, so as not to break the fast early with the joy of the Bridegroom’s presence in the Eucharist. Besides the Presanctified Liturgies, the Liturgy on Holy Thursday and possibly for the Annunciation are cases in point. 21 The cherubic hymn was introduced into the order of the Liturgy by the Emperor Justinian in 573 or 574. For the Liturgy of St. Basil, the proper, original cheroubikon is “Let all mortal flesh keep silence…”, borrowed from the Liturgy of St. James and now retained only on Holy Saturday. See Hans-Joachim Schulz, The Byzantine Liturgy, tr. Matthew J. O’Connell (New York: Pueblo Publishing Company, 1986), pp. 35-37. 22 Johann von Gardner, Orthodox Worship and Hymnography, vol 1 of Russian Church Singing, tr. Vladimir Morosan (Crestwood, New York: St. Vladimir’s Seminary Press, 1980), p. 84. 23 von Gardner, p. 87. 26 A specially painted or embroidered shroud. At one point this was the antimension from the holy table. 27 For those churches which observe fixed feasts according to the Gregorian calendar and Pascha according to the Julian calendar, the Annunciation will always fall before Lazarus Saturday. Despite directions in the typicon and Triodion that the Annunciation is always to be celebrated on the 25th of March, Greek practice in this century has delayed observance of the Annunciation to Bright Monday if it should fall anywhere between Holy Thursday and Pascha. 28 Ware, p. 62, n. 81. 29 This is basically a resurrectional-type matins, and the Greek/Mediterranean custom calls for the clergy to be fully vested in bright, gold vestments. 30 von Gardner, p. 88. 31 As in moving the matins Gospel for Sundays and feast days to between the 8th and 9th odes of the canon.